With a stay at Mountain Hostel - Swiss Hostel in Grindelwald, you'll be next to a golf course, a 4-minute walk from Grindelwald Grund Gondola and a 3-minute drive from Sportzentrum Grindelwald. This family-friendly hostel is 5.6 mi (9.1 km) from Eiger and 14.3 mi (23.1 km) from Lake Thun. Make yourself at home in one of the 30 guestrooms featuring espresso makers. Rooms have private patios. Prepare your meals in the shared/communal kitchen. Complimentary wireless Internet access is available to keep you connected. Bathrooms have showers and hair dryers. Enjoy the convenience of ski-in/ski-out access at this hostel, which also features a nightclub and outdoor tennis courts. Additional amenities at this hostel include complimentary wireless Internet access, ski storage, and tour/ticket assistance. Guests can catch a ride to nearby destinations on the complimentary area shuttle. Enjoy a meal at the restaurant or snacks in the hostel's 2 coffee shops/cafés. Wrap up your day with a drink at the bar/lounge. A complimentary buffet breakfast is served daily from 7:30 AM to 9:30 AM. 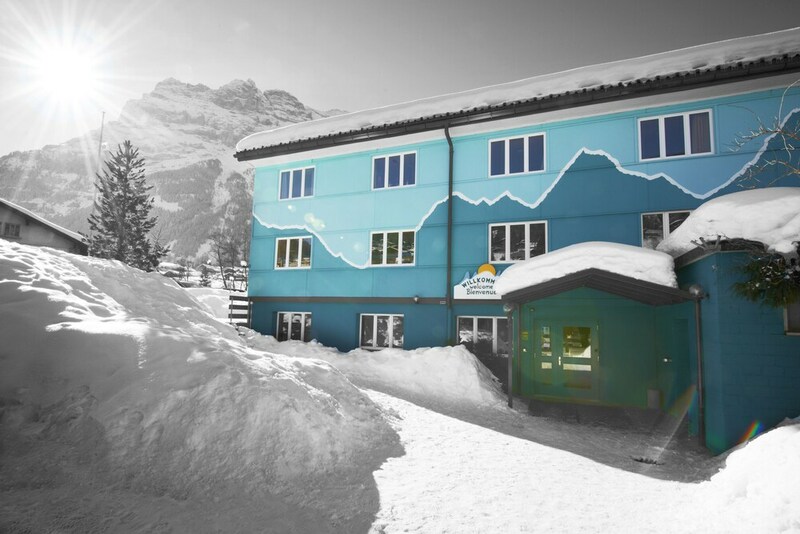 Mountain Hostel - Swiss Hostel helps provide the perfect ski vacation with ski storage and ski passes. When the sun goes down, sip après-ski drinks in the hostel's bar or mingle with other revelers at the onsite nightclub. Dining is available at the hostel's restaurant and guests can grab coffee at one of the 2 coffee shops/cafés. A complimentary breakfast is offered each morning. Wireless Internet access is complimentary. This ski hostel also offers outdoor tennis courts and a spa tub. Guests can use the indoor pool, outdoor pool, and health club at a partner property. Onsite self parking is complimentary. Mountain Hostel - Swiss Hostel is a smoke-free property. Mountain Hostel - Swiss Hostel has a restaurant on site. Recreational amenities at the hostel include outdoor tennis courts, ski-in/ski-out access, and a spa tub. Rollaway/extra beds are available for CHF 39.0 per night.